Contact: Director - Silvia Akter or Assistant Director - Lala Clark by phone between 7am - 6pm, Monday-Friday. License Number: Preschool #073401932. Infant #073407447. Ages: 3 mo. to 6 years old. Holidays: Consistent with the Moraga School District schedule. For more information, please contact (925) 377-8314. Enrollment is year round. Please call to schedule a tour. Spaces are limited. We look forward to meeting you and your child! Creative Montessori Preschool - Combine a dream, determination, a ton of passion and education. Sprinkle with a loving staff, endless creativity and a lot of play. Add lots of patience and endless hard work. Incorporate laughter, faith, hope and joy. Pour in lots of lovable children, with smiling faces. Sprinkle with a ton of kisses and plenty of hugs. Blend well.Combine a dream, determination, a ton of passion and education. Sprinkle with a loving staff, endless creativity and a lot of play. Add lots of patience and endless hard work. Incorporate laughter, faith, hope and joy. Pour in lots of lovable children, with smiling faces. Sprinkle with a ton of kisses and plenty of hugs. Blend well. Yields: One Happy and Loving Preschool! Our objective is to excel in providing the highest quality Child Development Center for your child. 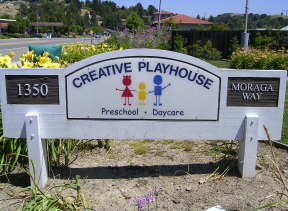 Creative Playhouse is consisted of an academic and play based curriculum. Creative Playhouse provides an environment that is clean, fun, creative and most importantly child centered. Each classroom is age appropriate and divided in several learning areas, science, art, math, language development, music, dramatic play, manipulative, and block play. Daily activities and curriculum are planned by our highly qualified and trained teachers.